"If you're not 100% satisfied, then the beatings will begin!" An now some dire direction from your Minion Foreman. We're back working on that darned maze this week. Sure but this would be a lot easier if they'd just use corn-stalks and pumpkins, but it's just not their way. Lots of life-stuff going on this week, so I'm going to keep it short and sweet. See you back here at the lair next Monday. Bring your friends! Oddly enough, I've encountered this same thing happening in a local fast food joint AND large retail store. Truly, Evil has it's hooks everywhere! We bow before you, Evil Overlord! Dude! 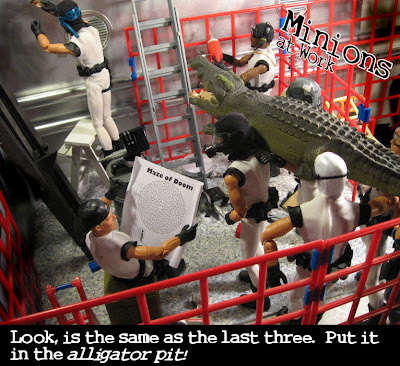 You GOTTA stop eating at the fast food with the alligator pit!